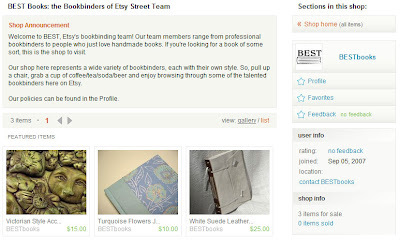 The Bookbinding Etsy Street Team shop is now officially open! The members of BEST will be contributing books to this shop to raise funds for the team. Add us to your favorites! This will become a great place to see a wide range of handmade books all in the same spot. Come and check out the selection often. This site becomes a lots of information nice site also good dear keep it up.